The image of Pluto on the right — an artist’s impression, to be sure (credit: NASA, ESA and G. Bacon, STScI) — suggests Ganymede to me more than Pluto, but we’ll have to wait and see what New Horizons turns up as it continues to close on its target. It’s worth thinking about how our views of this place have changed over time. The world found by Clyde Tombaugh seemed small enough when he found it, but a fraction of its light was actually coming from its yet smaller moon, which wouldn’t be discovered until USNO astronomer James Christy nailed it in 1978. Gregory Benford depicted Pluto with a nitrogen sea in a 2006 novel called The Sunborn, one in which he explored the possibility of life at -185 degrees Celsius, the lifeforms themselves the result of an experiment by heliopause beings who drew energy from magnetic interactions far from the Sun. Even more speculative is Stephen Baxter’s story “Goose Summer” (from the Vacuum Diagrams collection of 2001), in which Plutonian life physically interacts with Charon, the latter ‘seeding’ the Plutonian surface. But the real thing beckons. We now have images taken between May 8 and 12, downlinked last week. Here we’re looking at Pluto from a distance of 77 million kilometers using the now familiar Long-Range Reconnaissance Imager (LORRI) aboard New Horizons. The differences between this view and what we saw in April are striking. We’re now 35 million kilometers closer and have twice the pixels to work with, aided by image deconvolution techniques to tease out detail. Here’s the May 12 imagery as contrasted with April 16 — a click on the New Horizons link will show you two other photo sets contrasting the earlier and later views. 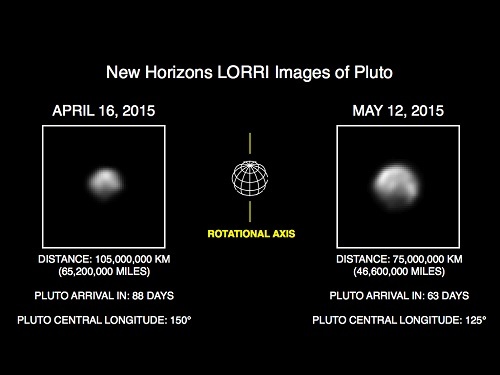 Image: These images show Pluto in the latest series of New Horizons Long Range Reconnaissance Imager (LORRI) photos, taken May 8-12, 2015, compared to LORRI images taken one month earlier. All images have been rotated to align Pluto’s rotational axis with the vertical direction (up-down), as depicted schematically in the center panel. Between April and May, Pluto appears to get larger as the spacecraft gets closer, with Pluto’s apparent size increasing by approximately 50 percent. Pluto rotates around its axis every 6.4 Earth days, and these images show the variations in Pluto’s surface features during its rotation. All of the images are displayed using the same linear brightness scale. The deconvolution method used to sharpen the images can, the New Horizons team reminds us, sometimes create artifacts, meaning that we’ll need to have the smaller details of these images confirmed as New Horizons gets closer. According to mission project scientist Hal Weaver (JHU/APL), as quoted in the New Horizons update linked to above, we’ll be seeing images with 5000 times better resolution when we reach closest approach during the July 14 flyby. We’re just seven weeks away from the flyby, with Stern now moving to the east coast for the encounter operations through late July. As excitement builds, a Pluto Safari smartphone app has appeared, available for iOS as well as Android. Produced by Simulation Curriculum Corp., the free app offers interactive views of the locations of Pluto and New Horizons, along with a timeline of New Horizons mission milestones and the latest news about the spacecraft. Pluto Safari is available here in its iOS version and here for the Android iteration. And so on. It’s a lively tale, a bit mesmerizing in its day (though it goes on far too long), and it mimics the approach of New Horizons as it describes the travelers’ view of “silvery white plains and its broken and enormous mountain ranges, whose snowy summits were offset by sheer black escarpments and ravines as hideous to contemplate as the craters of the moon…” The inhabitants of the ninth planet turn out to be nothing like Benford or Baxter’s creations, and the tale turns into something closer to Rider Haggard than modern SF as it winds its way to a conclusion. But still, what fun to think about Pluto as it was first envisioned in fiction while we have a spacecraft moving in on the Pluto/Charon system at 1.2 million kilometers per day. Each new set of New Horizons images is going to sharpen our view of a world. If only Stanton Coblentz, and for that matter Clyde Tombaugh himself, were able to watch this encounter unfold. I read Heinlein’s “Have spacesuit, will travel” in junior high back in the early 60’s. Lots of hard science for a “juvenile” book. The bad guy’s base was on Pluto. I was a space travel fan forever after reading that story. “Wait It Out” was a favourite of mine – I think I first read it in Asimov’s anthology “The Science Fiction Solar System” just a few years before its setting in 1989. The unfortunate cryonaut/astronaut encountered Plutonians, who were living blobs of helium super-fluid. However Pluto never gets cold enough for helium to liquefy as depicted. 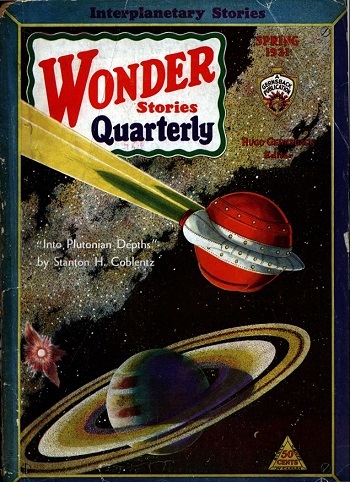 Nor does the “Dark Side” of Mercury, as in another Niven story, “The Coldest Place.” But then several Niven settings haven’t survived the revelations of 1960s space-probes – his acidic NOx Mars was disconfirmed by c.1964, while the Stygian “searing black calm” at the bottom of Venus’s atmosphere lasted until c.1975. Mercury’s rotation was confirmed by c.1965, but the high density Pluto was a maybe up until 1978. Clyde Tombaugh searched extensively for worlds beyond Pluto once he had made his famous discovery in 1930. He said he found nothing else out that way. However, did anyone check his plates later on? Did he come across some other Kuiper type bodies and miss them? I am amazed it took until 1992 to find another friend for Pluto. If nothing else, searching the archives could give us new discoveries of KBOs and refine orbits for existing worlds we know of. Every time a new KBO is discovered, people go back through archives of older observations and see if the object is present on them, in order to determine its orbit. Correct me if I’m wrong on this, but I don’t think there’s anything remotely the same size in Pluto’s neighborhood. Nearly all of the other “plutinos” (objects in a 3:2 resonance with Pluto) are tiny, and Tombaugh would have been unlikely to find them. The second-largest plutino, by far, is Charon, and he didn’t have remotely the technology at his disposal to ever resolve it so close to Pluto. 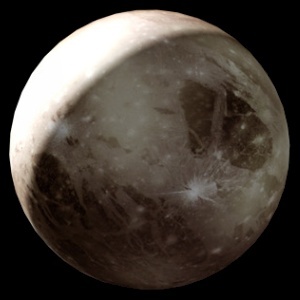 The third-largest, Orcus, is about one-third the size of Pluto, and three full magnitudes dimmer. The only TNO’s we’ve found anywhere, other than Eris, are only about 60 percent of Pluto’s size and almost always much lower albedo. Hence, much harder to spot even if someone were looking for them, which few people were. Given those circumstances, it’s not that strange that no one found any KBO but Pluto and Charon (a “double dwarf planet,” IMO) prior to 1992. Last week the New Horizons mission released a few new processed versions of their latest and greatest images of Pluto. They’re the best images of Pluto that Earth has ever seen, but they’re still a long way from what New Horizons will be able to show us, six weeks from now. A lot of people are commenting that Pluto does not look round in these photos. You’re right, it doesn’t look round, but that’s just an artifact of the way the camera works and the way the images have been enlarged and processed. The processing tends to turn anything that is especially bright into something that looks like a mountain, and anything that is especially dark into something that looks like a hole. In fact, since Pluto is quite large enough for the force of its self-gravity to overcome the strength of its icy material, there is no question that it will be very much round, more round than Ceres. (Pluto has the same density as Ceres, so has similar ice/rock composition, but Pluto has more than 14 times Ceres’ mass, so its gravity is significantly stronger.) Roundness is one of the very few things that we can confidently predict about Pluto before New Horizons’ flyby, because basic physics does a remarkably good job of predicting bulk physical properties of space objects. To give you a sense of what the photos looked like before manipulation, here’s a raw image taken from the New Horizons website.